Steve Kronen is a master of what we might call the “high” art of poetry, by which I mean a poetry in which the craft is deep and various and the knowledge of poetic and cultural traditions informs—and even determines—the poet’s formal choices, intellectual range, and emotional responses to his chosen subject matter. 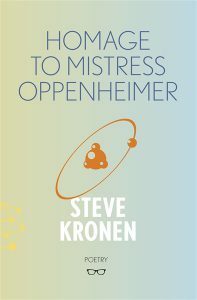 In his most recent book, Homage to Mistress Oppenheimer, Kronen’s embrace of traditional forms is both assured and innovative. In the best of these poems, the poet’s wide-ranging, multi-faceted references to intellectual, cultural and scientific traditions feel embedded organically in the language, part of the very sinew of the verse. The poems embrace a mind-boggling cast of characters from high and popular culture and ideas ranging across the Western canon, to say nothing of a host of well-known and not-so-well-known poets. In a less assured writer, in fact, such constant formal and intellectual pyrotechnics might seem mere affectation, a pretentious and show-off-y affirmation of the poet’s knowledge of the Western canon, a kind of acrobatics of the soul. In Kronen’s best poems, though, such acrobatics seem part of the poet’s blood and marrow, embedded in his heart and central nervous system. In these stronger poems, in fact, the present world and the world that lies behind and before it, are braided in fresh, original ways. This is a strong book, unfashionable in its artistic gusto and challenging in intellectual range, one that apprentice poets as well as long-term practitioners can learn from and enjoy. Even in this short excerpt, Kronen’s wide embrace is emphatic and impressive. The pleasure in the play of language is manifest. It is also obvious that the poem won’t be captured on a single reading. Rather, one must sit with it a while. In the case of this poem, real rewards follow. In some others, though, in which the play is not so exuberant and the language not quite so scintillating, the poems—which in fact require explanatory notes to be fully grasped—one comes away merely befuddled. Even these less-successful poems, though, resist obscurity and work as poems—that is, as made things—as Kronen’s language is always clear and well-wrought. Kronen aspires not toward Ashbery or Carson; his contemporary masters are the likes of Justice and Wilbur. had ever left to play baseball. strike out on your own. Michael Hettich’s books include Systems of Vanishing (University of Tampa, 2014), The Frozen Harbor (Red Dragonfly Press, 2017), and Bluer and More Vast (Hysterical Books, 2018). He recently moved from Miami to Black Mountain, North Carolina.